One big happy family... There's Murray, Beepsky, and Super Protector Friend on the top. You're using the wrong URL, right click the actual image and click "view image in new-tab" and copy the URL or "copy image URL" and use that link instead. Find a better image host. A spontanious conscription takes place, and Emilio Tapman gets conscripted thrice. What's the story behind this? I've never seen that thing ingame. Yeah, how do we make Wanted Posters? 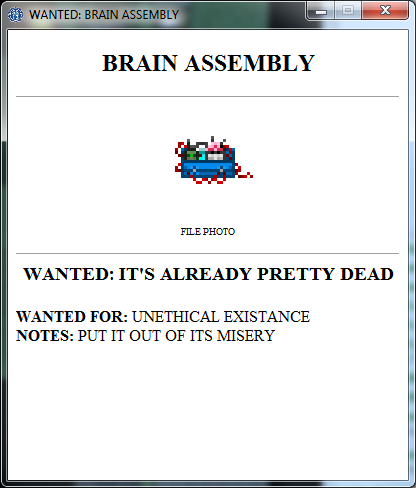 Both wanted posters and brain assemblies are, if I recall, in-progress features that were being thrown around for a couple of rounds by admins to test them out before making them publicly available. Security will be able to print wanted posters, and the brain assemblies are presumably that robotics thing that everyone's clamoring about. 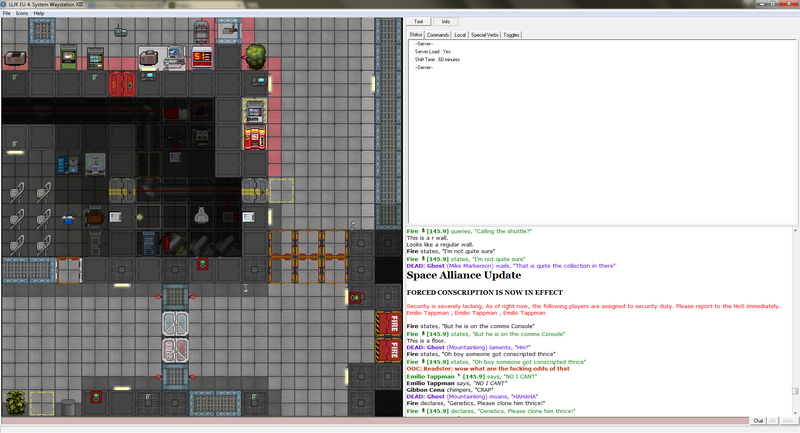 YES SCUTTLEBOTS CAN TRAVERSE space. Let's see...looks like a toolbox, a brain, a proximity sensor, some wire, and some metal cylinder I don't recognize. Wonder what it does. Note: I have no idea what this is, either. But to me it looks like a health analyzer, a remote signaler, and a borg head with exposed brain in a wired up toolbox. That is right on the money for whatever the heck that thing is.